Publications - EMILIE DAY CORREA, ED. D.
Two alarming trends are on the rise in schools; violence and our nation’s hyper-focus on common core academics and standardized test scores. As a proponent of Social Emotional Learning (SEL), and whole child education, I believe that schools have a societal responsibility, as stewards of the public, to prepare students academically, socially, and emotionally to ensure well-being in school, life, and career. Historically, middle schools have struggled to implement SEL programming. Students have found canned, scripted SEL programs to be contrived and in-genuine. Much like trying to force a square peg into a round hole, middle school SEL programs have failed to deliver authentic, effective, developmentally appropriate lessons and activities. Expensive SEL programs have been purchased with best intentions, yet somehow find their way onto shelves where they are merely collecting dust. As such, middle schools across the nation have all but thrown in the towel as efforts to implement SEL continue to perplex school leaders. We must keep in mind that although the challenge to teach middle school SEL seems insurmountable, failure to do so is a disservice to our students, our school culture, and our communities at large. With over 15 years of experience in middle school teaching and learning, I have witnessed firsthand how students struggle with identity, a sense of belonging, and relationship skills. This journal was created in response to the need for authentic SEL programming in middle schools. Through a series of introspective prompts, students engage in Self-Awareness through journaling. If used as designed, students experience Social Awareness through community building dialogue during circle share-outs of reponses. 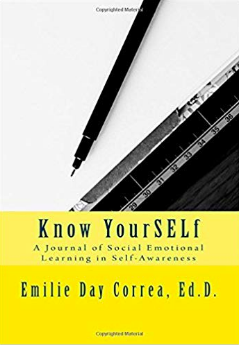 This journal not only serves as an effective tool for self-discovery, it also facilitates a sense of understanding, acceptance, belonging, and connection among members of a group. SEL has made its way to both the national and international spotlight in educational discourse. Extensive research has helped define the “what” and the “why” of SEL. This journal provides a solution for “how” to integrate SEL through simple, engaging, organic, and reflective journaling practices. Through the use of thought provoking journal prompts, journaling activities aim to inspire students to peel back their proverbial layers, discover their innermost self, identify their strengths and challenges, make connections with classmates, and realize their full potential. Conócete a Ti Mismo se compone de una colección de frases, preguntas, y actividades que promueven la reflexión y conocimiento a si mismo, una clave esencial del desarrollo personal y social. Este diario ayuda a despegar nuestros niveles más externos y acercarnos más a revelar nuestra verdadera identidad. Idealmente, este diario se usará en un grupo para mejorar la capacidad relacional, desarrollar el sentido de comunidad y pertenencia entre los miembros del grupo. Participación en la autorreflexión de los temas de este diario, junto con compartir en grupo, permite a los miembros del grupo obtener una comprensión y apreciación más profunda de sí mismos y de los demás. El desarrollo personal y social se ha convertido en el centro de atención nacional e internacional en el discurso educativo. Una amplia investigación ha ayudado a definir el "qué" y el "por qué" del desarrollo personal y social. Este diario proporciona una solución de "cómo" integrar el desarrollo personal y social a través de prácticas de escritura de 5 a 7 minutos simples, auténticas, y reflexivas, seguidas por compartir en grupo. Enseñar y practicar las habilidades y competencias del aprendizaje personal y social en las escuelas es imperativo, y el no proporcionar esta educación en las escuelas es un perjuicio para nuestros estudiantes, nuestra cultura escolar y nuestras comunidades en general. by Emilie Day Correa, Ed. D.